Imports of ethylene polymers from Asia-Pacific sources went up from 35% of China’s total in 2017, to 39% in 2018; imports from the Middle East dropped from 51% in 2017, to 47% in 2018. Duties of 25% on imports of several ethylene polymers from the US went into effect on August 23rd. Imports from the US peaked in August and then declined. 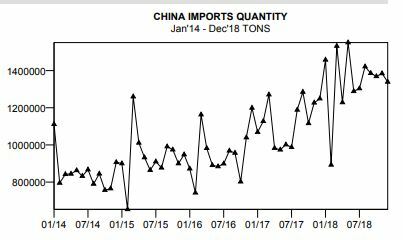 By December, ethylene polymer imports from the US were down to 2.1% of China’s total for the month. China’s imports of ABS and polystyrene set new records and contributed to the 23% rise in total imports of styrenic polymers. Only 52,000 tons of recycle polymers were imported into China in 2018. In contrast, in 2014 China had imported 7.5 million tons of recycle polymers. The drop severely impacted recycle polymer exports from Europe and North America. China exported 11.5 million of fabricated plastic products in 2018, up 11%. In advance of possible further increases in duties, China increased shipments of several fabricated plastic products to the US in the second half of 2018. A leading example was PVC Floor/Wall Coverings; exports to the US of 2.2 million tons in 2018 were up 56%.